Since debuting with WALKING OFF THE MAP in 2006 the Man of Kent hasn’t looked back, releasing top quality albums and EP’s when it suited him and when he alone felt the time was right. His last album, A TRAIN BOUND FOR GLORY was his most ‘American’ to date as he merged his Folky songs with Americana and Country melodies and observations and now he’s moved that sound on yet again; but this time; if I dare say it; it sounds like he was listening to a lot of Beatles music circa RUBBER SOUL to create arguably his most complete and possibly best album to date. The single Hang My Head in Shame, gets the party started with some deliberately dirty guitar licks under a slightly distorted vocal that manages to echo Johnny Cash, The Beatles and Chris Isaak all at the same time. Out of nowhere we even get a bit of a Twang-fest with I Got Mine when Pete and cohort ‘Little’ Barrie Cadogan harmonise as the latter produces some wonderful sounds out of his electric organ. The song is very 60’s influenced but still sounds perfectly fresh and sharp. Dear Marie is positively delightful as Pete delivers a very wry love song over a jaunty guitar and piano backbeat; that wouldn’t be out of place on the Opry stage. 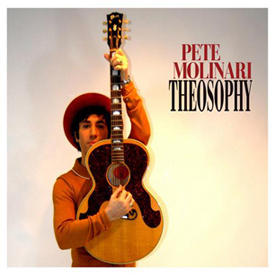 As an unadulterated fanboy I absolutely love Mighty Son of Abraham with its swing-a-long chorus and biting lyrics and the rocking Evangeline just might be on the verge of becoming my favourite Pete Molinari song…ever! THEOSOPHY ends with a slightly exotically Eastern flavoured Love For Sale which might be pointing us in the direction of Sgt. Peters Lovely Heart Warming Band for the next album; who knows? Who cares? THEOSOPHY is what it’s all about and I urge you to pick up a copy tomorrow.